Posted: March 30th, 2019 under Hamradio, LoTW. 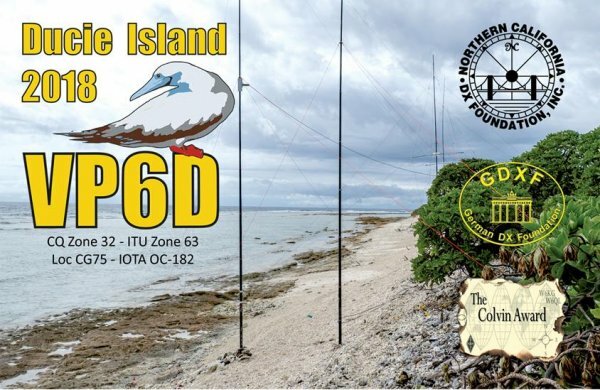 A while back, I got VP6D Ducie Island on LoTW. This was #335 on LoTW, which means that I now have #331 current entities confirmed on LoTW. With that last confirmation, I now qualify for honor roll with confirmations only on LoTW. I have not applied for the diploma, but it is just a matter of doing it, since everything exists online. Thank you to all LoTW users. This makes collection confirmations so much easier, than getting all the paper cards. I still have many paper cards lying around, and I can understand those that prefer them. Speaking for myself, my cards collect dust in boxes 99.9% of the time. I rarely ever look at them, and I can’t remember the last time I showed them to someone. Posted: December 31st, 2018 under DX, Hamradio, Iota. 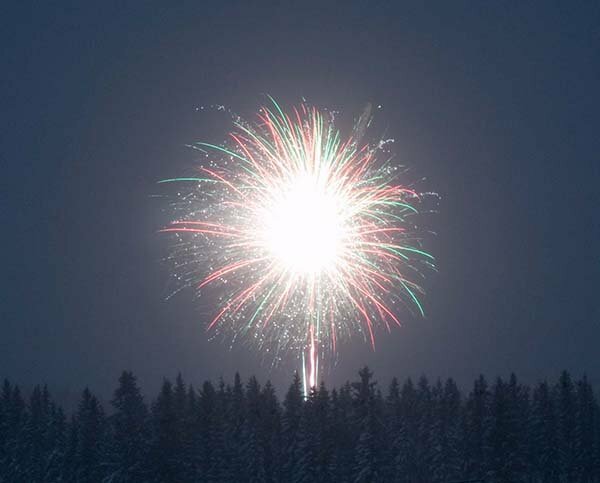 Happy new DX year everyone. It’s been a while since I’ve posted. Life is busy, but I have managed a few contacts during the year. Below is a short summary of the new stuff I worked. On August 19th, I worked RT65KA on 20M CW from iota AS-065 for a new iota. ZS9V was worked on 17M CW from iota AF-064 for another new iota. On September 10th, I worked RI0B on 40M CW from AS-121 for a new iota. On September 15th, I worked RI0B on 20M SSB from AS-054 for a new iota. On September 16th, I worked RI0B on 40M CW from AS-104 for a new iota. On September 20th, I worked RI0B on 20M CW from AS-087 for a new iota. On September 30th, I worked 9X0T on 40M CW for a new one on 40M. 9X0Y was worked on 30M FT8 for a new one on digi. 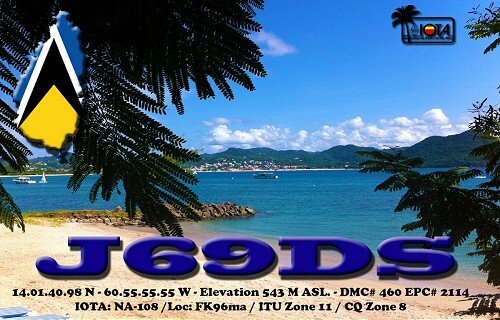 TO6OK was worked on 30M FT8 for another new one on digi. On October 5th, I worked RI0BC on 40M CW from AS-042 for a new iota. RI0ANL was worked on 30M FT8 and 40M CW. On October 10th, I worked TT8KO (LA7GIA) on 20M CW. I was very lucky that I managed to work him, as he was shut down quickly after that. He wasn’t allowed to operate any more radio on that trip, and he almost wasn’t allowed to leave the country. Luckily, he got home safely. On October 20th, I worked ZL7X on 30M FT8 for a new one on digi. On October 21st, I worked VP6D on 40M CW for a new one on 40M. On October 25th, I worked KP4/EI9FBB on 20M CW from NA-249 for a new iota. On Otober 26th, I worked VP6D on 30M FT8 for a new one on 30M and digi. On October 27th, I worked VP6D on 30M CW. On November 3rd, I worked YJ0GC on 40M CW for a new one on 40M. On November 4th, I worked Z23MD on 17M, 20M and 40M CW. That was a new one on 20M. 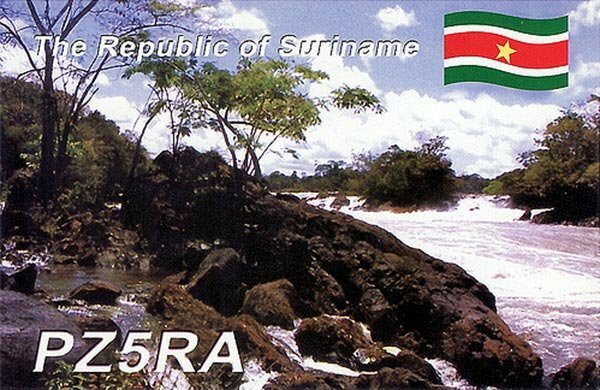 On November 18th, I worked EP6RRC on 17M CW from AS-189 for a new iota. Posted: September 23rd, 2018 under 6M, Hamradio. On July 21st, I worked Z68M and Z66X on 6M FT8. A few minutes later, I worked Z68M on 6M SSB. I knew that Z6 would be pretty easy from here once they were allowed on 6M. This was in the morning, later the band opened to North-America. I worked one station from USA. The band was quite spotty, and I heard several KP4 stations. I worked WP4AZT in FK67 on 6M FT8 for a new gridsquare. A few minutes later, I worked HI8PLE in FK58. That was yet another new gridsquare. FG8OJ, FM5AN, KP4EIT and CO8LY followed right after that. While conditions were up and down, I copied KP4 for a long time. And just when I thought it was dead, J69DS finally popped up at my place. I quickly worked him for #156 on 6M. On August 2nd, the band once again opened to North America. I worked ZF1EJ on 6M FT8. That was only my second time I heard ZF. The first time was many years ago when we had F2 propagation. Following that contact, I worked 6 stations from USA. 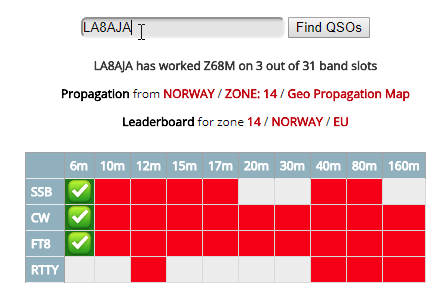 On August 3rd, I worked LA6OP in JP67 on 6M FT8 for a new gridsquare. I visited Sindre’s qth back in 2005, when we activated EU-062 for iota. He has a nice qth on an island, with a nice take-off. Posted: August 3rd, 2018 under 6M, DX, Hamradio. Z68M logsearch on Club LogAfter working two new ones on 6M, I didn’t really have my hopes very high for this season. New countries are difficult to come by, but suddenly they show up. So here is another dx report from me. On July 3rd, I managed to get KH1/KH7Z on 20M CW. I didn’t really think I would work them, as the time of year makes this one difficult. Combine this with full time work and small kids, and the difficulty increases a lot. I did hear them on Sunday morning on 20M CW, but I could not break the pile-up. I didn’t copy them on FT8 either. But when I checked 20M CW after the kids went to bed, they had a readable signal. After a few tries, I managed to work them. This just shows that having a station on 20M at all times, does pay off. KH1 was a new one on 20M CW for me. On July 6th, I got a text from LA4GHA alerting me of Z6 and 3A on 6M. As I had to pick up the kids and get them home, I rushed to get on the air. Z68M was strong on 6M CW, and after a few calls, he came back. That was #154 on 6M. I changed to FT8 and started listening for 3A. I could see him, and started calling. He came right back to me, and after a few periods, I got the 73. 3A/EA6SX was #155 in the log on 6M. I’ve been hunting 3A for many years, but I have had no success on getting one in the log. I’ve heard them, and almost made a qso, but this was the first time I finally logged Monaco on 6M. On July 11th, I worked OX3LX on 6M FT8. I’ve been listening for Bo for several days without success. Usually the conditions appeared after I went to bed. While sitting in front of my PC, Bo suddenly came in here on FT8. I quickly worked him for a new field (HQ) and grid (HQ90). I also worked TF1A on 6M FT8. On July 11th, I worked Z68M on FT8 and SSB on 6M. Z66X was also worked on 6M FT8. Posted: July 22nd, 2018 under 6M, DX, Hamradio. By now the 6M band has been open several days. Here is a short list of some of the highlights of what I worked in June. On June 2nd, I worked UN3M on 6M FT8. On June 3rd, I was surprised to suddenly see PZ5RA running on 6M FT8. I gave him a call and quickly logged him for #153 on 6M. That was the first time I have every heard PZ on 6M. I know it was worked from Norway during the F2 days several years ago, but I never heard PZ back then. I worked S01WS on 6M FT8. CU2AP, VP2EIH, YV5LI and TF8V was also worked on 6M FT8. CT1JML (LA9PJA) was worked on 6M CW from his QTH in Portugal. On June 4th, I worked OH0Z and ZA/OG2M on 6M CW. On June 5th, I worked 7X2TT and EA8CNR on 6M FT8. On June 6th, I worked SM/DM3CK on 6M JTMS from JO98 for a new grid on 6M. On June 9th, I worked Z37M on 6M FT8. I didn’t have Z3 on 6M LoTW, so that was new one for LoTW. On June 10th, I worked 9G5AR and NL8F on 20M FT8. NL8F was operating from NA-059. If you have watched Deadliest Catch, you have heard about Dutch Harbor. That was his qth. On June 14th, I worked D41CV on 6M FT8. That was a new one on 6M LoTW. I did hear 5T2BI?, but I didn’t manage to work him. I also heard TZ4AM on 6M CW, and he heard me, but conditions faded before we could make a contact. On June 24th, I had my first opening this year on 6M to North America. I worked 10 contacts from AZ, TX, CO and MO on FT8. K1USA from MO, was state #43 on 6M. On June 25th, we had some strange conditions. It was a mix of aurora and auroral-e. OX3XR was booming in on 6M CW from GP44. That was a new grid on 6M. I did manage to work LA5SJA in KQ50 and LA1PHA in JP76, both on 6M FT8. with those 3 new grids, I passed #800 grids worked on 6M. I did also hear several other LA, OH and SM stations in that opening.